January 2019 was a fantastic month. It was the start of a new year, as well as start of my last semester in college (as long as I pass all of my classes at least). But, do you want to know what really made this past month a great month for us? We paid off the last of our credit cards!!! You heard me right. We paid off all of $6,000 of credit card debt we had : ) And we’re absolutely stoked about it. The debt was from a variety of things – wedding costs, school stuff, and just living expenses in general. It was kind of the “normal” credit card debt that“normal” people have. But, I wasn’t okay with just being“normal”. I didn’t want to be 30, 40, or 50 years old and have credit card debt. There are few things I hate in this world, and credit card debt is one of them. So, in the span of 16 months, we paid it off. And here are the four things we did to pay off our credit card debt. Nothing happens in our lives until we first have a desire to actually do something. The process is simple. If you want something bad enough, then you’ll do what it takes to get it done. For example, this morning you probably woke up, felt you were hungry, and wanted to eat. Then, I’m just guessing that you did something about it, like pouring yourself a bowl of cereal or making some oatmeal (my personal favorite). It’s a silly and obvious example but there’s a fundamental principle behind it. You’re not going to do something until you want it bad enough. Sure, you can say to yourself that you’d like to pay off your credit card debt, but how bad do you actually want it? What are you will to sacrifice to actually pay it off? What are your “favorite vices” so to speak? It could be clothes, furniture, eating out, or a mix of different things. My favorite vice is definitely eating out. I like eating at home, but as you probably already know – I’m a food junkie. And it’s sooo hard for me to turn down the chance to eat out. I love food. And it’s an expensive love, especially if I’m not careful. It got to the point where paying off our credit card debt was more important than eating out. We cut back immensely on eating out, I bought a 20 pound bag of rice, and we eat a lot cheaper meals at home like chicken and rice, ham casserole, or spaghetti. You don’t have to eat ramen noodles and beans all the time either. Make sure you’re still maintaining a healthy and balanced lifestyle. This desire led to something more. If you’ve tried making a budget before that didn’t work out, that’s okay. The same budgeting system will not work for everyone. You just have to find the system that works best for you. For example, a cash envelope system typically works best for myself. This is when you split up your cash for the next 2 weeks or month into envelopes. You have envelopes for all the different categories in your budget like groceries, gas, clothes, utilities, etc. Just do this for categories that you struggle keeping under budget. The cash envelope system is great for me, but it doesn’t work the best for my wife. She likes keeping a digital budget on a spreadsheet.We type in our expenses over the month and the spreadsheet tells us how much we’ve spent in a certain category and how much money we have left to spend for the month. If you want help creating a budget, check out these 6 tips for making a budget. 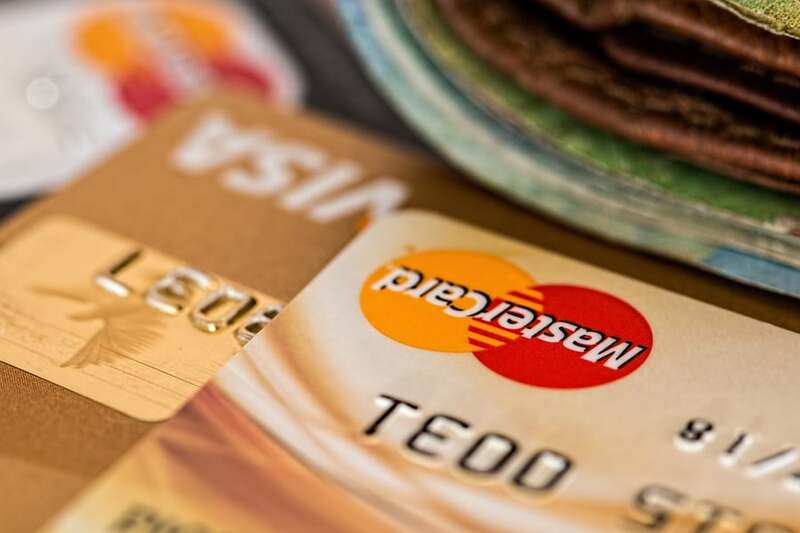 Making a budget is one thing, but there’s more that has to be done if you want to make progress in paying off your credit cards. Writing down your budget is one thing. But actually following your budget is an entirely different story. Did we follow our budget perfectly? No. There were some months where we definitely struggled and spent more than our budget. It happened multiple times and we had to learn and adjust. We’re still learning and adjusting now. The important thing is that we didn’t give up and that we kept working at the budget. That is the key. Budgeting and going $50 over budget is a lot better than not budgeting at all! In order to help us follow our budget, we have a weekly family council where we go over our spending and where we’re at for the month. This helps my wife and I a ton with communication. If you don’t have a certain time set aside every week or at least every month to talk about the finances with your spouse, then make one as soon as you can! It’s so much better have a set time when you know you’ll be talking about finances instead of finances coming up because of an argument about buying something we didn’t have the money for. Paying off your credit card debt probably isn’t something you can do overnight. It might not even be something you can do in a year. It took us longer than a year and it may take you several years. But that’s okay! It is well worth the time and effort. Paying off your credit cards is like running a marathon. It can be a long road ahead and you’ll need to pace yourself or else you might get burnt out. If you’re not careful, you might want to slow down – or even worse – quit. The thing to remember though is that slow and steady wins the race. As that old saying goes, “Rome wasn’t builtin a day”. It takes time and effort to do something great. And paying off all of your credit cards is something great. It won’t be easy and it will take time. But it is well worth the effort and you will thank yourself a million times over when you accomplish it. That’s a promise. We are really excited to have paid off the last of our credit cards. Next up is to pay off our car loan. It’s several thousand dollars and we’re getting ready to move but I’m confident we can get it paid off within the next year and a half. And once we do that, we will never, ever take out a car loan. We won’t need to. And we won’t want to. Our motivation to get out of debt while we’re still in our 20s is much greater than just being “normal”. Do you have a desire to get out of credit card debt? Is your desire to pay it off greater than your “favorite vices”? I promise you the sacrifice is well worth the reward in the end. And I know you can do it, even if it takes you longer than you’d like.